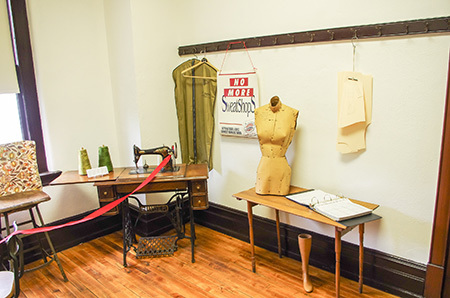 The Textile/Apparel room recognizes the extensive influence on the area by the textile and apparel industry. 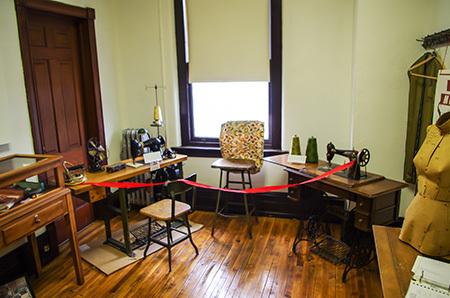 On display are two old home sewing machines and one industrial machine. 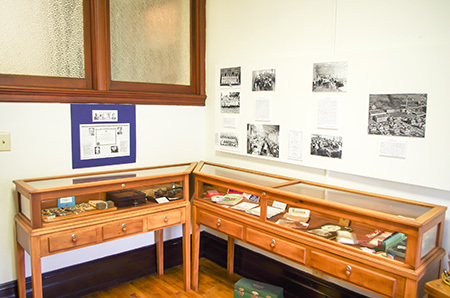 By-products are showcased along with numerous photos, knitting tools, equipment and written information. Slate was Bangor’s primary industry, yet as it declined, the cloth and apparel businesses took over as the town’s employment mainstay. In 1905, the Bangor Silk Company was incorporated, followed by the Crown Silk Manufacturing Company. In 1907, the Sterling Silk Glove Company came into existence. Julius Kayser & Co. purchased the Sterling and Crown Mills in 1919 and by 1936 became the largest textile industry in the Slate Belt. Other silk and clothing manufacturers were Bangor Fabrics Co., Bangor Hosiery, and Finkbiners. Korn Brothers leased a mill on Pennsylvania Ave. for the manufacture of nylon cloth and was called Bangor Mills, Inc., later bought by Collins and Aikman, makers of fabrics for clothing and upholstery. In 1937, Max Winkler incorporated Blue Ridge Textile Company, located in the old H.F. Raub Silk Mill in South Bangor. The company was largest single supplier of knit upholstery fabric to the automotive industry and fabric for military uniforms. Yet, as large as the textile industry was in Bangor, the apparel industry soon came to revel in success as well. It began with Lunden Heimer and Vincent Bruno, who contracted for men’s shirts in 1908. The Steinmetz brothers were also involved in the manufacturing of men’s shirts, along with many others. Some early pioneers were Anthony and Joseph Ronca, who made pajamas in their plant in Roseto in 1930. In 1931 famous B.V.D. men’s underwear was produced at Fashion Robe by Royal Manufacturing Co. and managed by Nick Del Grosso. The Perfect Shirt Factory was started in 1934 by Anthony and Joseph Capozzolo followed by Mariano and Victor Saveri who operated the Pennsylvania Shirt Company. Numerous other businessmen went on to the venture of the apparel industry and to this day some mills are still in operation.